Standing above the entrance to the River Tyne, Arbeia Roman Fort guarded the main sea route to Hadrian’s Wall. It was a key garrison and military supply base to other forts along the Wall and is an important part of the history of Roman Britain. Step into the Fort and immerse yourself in the world of the Romans right in the heart of South Shields. Have a look inside the full-scale reconstructed Roman buildings including the West Gates and Commanding Officer’s house and a soldier’s barrack block, witness live excavations and see one of the finest collections of finds from Roman Britain all found in and around Arbeia. Stories are brought to life at Arbeia through a variety of events and displays including gladiator battles, falconry displays, Roman re-enactments, storytelling and more. 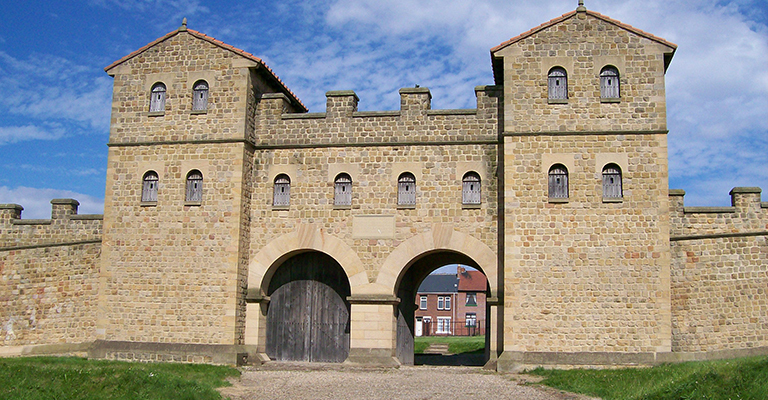 Arbeia Roman Fort is located between South Shields town centre and the sea front at the top of the Lawe Top. Arbeia is accessible from South Shields town centre on foot in a 10-15 minute walk. Leaving the town centre head along Ocean road towards the sea front, you will see a stone pillar with a Roman soldier on at the corner of Ocean Road and Baring Street. Turn left here and follow the road up until you find the Fort. If travelling by car follow the brown tourist road signs with a Roman helmet on from the A19 into South Shields town centre. From here Arbeia continues to be signposted, but if you lose a sign ensure you stick to the A183 which becomes Ocean Road. Turn left onto Baring Street and continue to the top of the hill where you will find the Fort. Street parking is available but can be busy around school run times as Arbeia is situated opposite Hadrian Primary School. There are two coaching bays on Baring Street. Coaches and taxis can drop off at the main gates. There is a perimeter fence surrounding Arbeia Roman Fort with the main gates situated half way along the Baring Street side. The approach to the main entrance to the museum building entrance is flat tarmac and concrete. There is a short flight of steps leading to the building as well as an accessible ramp to the right. The doors entering the museum are heavy double glass swing doors. There is also a set of these doors exiting the building on the other side which takes you to the main Fort site. The surface around the Fort is generally flat but uneven and can vary from grass to gravel. The main paths throughout the site remains are original Roman roads covered with gravel and stones so please take great care when exploring and making your way to the reconstructed buildings. There is flat level access around the Commanding Officer’s house and barrack block but some of the floors are uneven. The reconstructed West Gate has three floors. There is a single step up into the ground floor of one of the Gate towers. The next two floors are accessed by a steep, narrow wooden staircase inside. TimeQuest is accessed via a small set of steps but there is a flat access route if needed. Please speak to a member of staff for guidance. Inside TimeQuest there is a short section of steps leading to the interactive excavation area. Inside the museum building is flat level access. Directly outside the museum building is the herb garden which has flat level access. The garden room next to the museum building is accessed through push handle doors which open outwards. The garden room is flat level access. There is a range of seating across the Fort including a wheelchair accessible area with picnic tables and benches. If you require the use of a phone in emergencies or to book a taxi for disabled visitors please speak to a member of staff at the reception desk. A wheelchair is available for visitor use. Please ask a member of staff who will be able to assist. Arbeia welcome assistance dogs. Please let them know if you require anything for the dog whilst in the museum. Arbeia don’t have an induction loop facility however they do have free-standing, battery-powered listing points. Large print copies of the audio commentaries and a portable induction loop are available. Please ask a member of staff if you require one. There is a large tactile plan of the Fort adjacent to the first fixed listening point. There are a number of fixed listening points across the site which have two metallic push buttons giving more information about the part of the Fort you are currently at as well as giving a commentary from one of the characters who lived at the Fort. Large print guides and Braille guides are available on request. Please speak to a member of staff if you require one. Guided tours of the Fort can be booked but will incur a charge and need to be booked three weeks in advance. Please contact the museum to arrange this. The fire alarms have voice evacuation sounders and visual flashing lights in the museum, TimeQuest and reconstructed buildings. If you will require assistance exiting the site in the event of a fire alarm please inform a member of staff on your arrival. The male toilets are on the end of the museum building nearest the West Gate with the female toilets on the other end near to the garden room as is the accessible toilet. Unfortunately there is no baby changing facility on site. Arbeia doesn’t have any refreshment facilities, however you are welcome to bring your own picnics and other refreshments and eat them on the lawn or in the picnic area.